A number of leading food companies have announced investment in food traceability innovations and technologies. 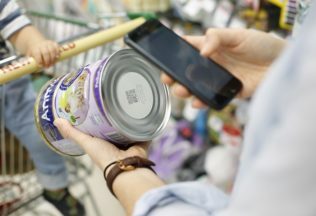 Companies involved including Fonterra which is now using QR codes to help provide confidence in their infant formula and Australia Post, Blackmores and Alibaba which are trying to fight food fraud in China with innovative technology. Fonterra has started placing QR codes on its Anmum infant formula so customers can trace the product. Each QR code can be scanned using a mobile phone app which verifies the authenticity of the product and its batch number. The QR code can be scanned at any time after purchase for customers to get updates on the product if required. Group Marketing manager of Anmum, Teresa Smyth, said as a mum of twins herself, knowing where a product comes from gives her confidence. “By scanning the QR code to trace the product’s journey, consumers can be reassured about the quality and safety of our products – and this is fundamental to being the most trusted source of dairy nutrition,” she said. Fonterra General Manager trust in Source, Tim Kirk, said Fonterra is on track to have total electronic traceability to world-class standards by 2020. “In attaining total electronic ‘traceability we have broken down the job into achievable steps,” Kirk said. “By the end of this year, 90 per cent of our plants globally will have traceability data electronically connected, with the remaining 10 per cent to be completed in 2018/2019,” he said. “Ultimately we will have full electronic traceability for every drop of milk starting with where it came from. This includes every stage of processing, every ingredient, every product and our direct sales to customers in more than 100 countries,” Kirk concluded. Australia Post, Alibaba and Blackmores have also teamed up to invest in new innovative and technologically-driven practices designed to stop food fraud in China. The initiative will increase the traceability of food products, reduce the risk of fraud and help ensure Australia remains a trusted exporter of high quality food. The companies are exploring blockchain technology, a decentralised database which could obtain crucial details from suppliers about where and how their food was grown and map its journey across the supply chain. “We are delighted Alibaba has invited us to create an innovative platform, which will track food from paddock to plate, strengthening the supply chain,” said Australia Post Executive General Manager of Parcels, Bob Black. H2Coco has designed a special line of coconut and melon waters to fit in lunch boxes. Coopers has opened a $65 million malting plant at its Regency Park brewery in Adelaide.